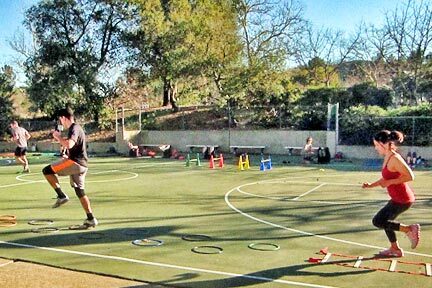 Our Alamo Fitness Classes are M W Th F at Rudgear Park, Monday – Saturday. Memberships allow you to visit any Gumsaba location. Gumsaba Fitness in Alamo is a community of healthy, vital, energetic people who love the outdoors. The confines of a gym are of no interest to us! Breathe the fresh air, meet fun people, see beautiful sunrises and enjoy tough drills that will give you a new lease on life. Gumsaba coaches are trained to help you find the joy in fitness so you can keep it up for life. Our programs give you a platform to learn and grow and will continually challenge you to be your best. We encourage you to commit to yourself over any one else. Unlike the gym, we actually want you to come to class! Our individualized programs are designed so that you can work around any injuries you have and still get a killer workout in. Your instructor will help you modify and give you exercises to improve and rehab your injuries. Classes are one hour long during morning hours. Gumsaba Outdoor Boot Camps will GET YOU FIT!